Those who have read the jump by Charles Perrault or watched the cartoon “puss in boots”, remember how much trouble was the cat that didn’t want to catch mice… So it opened a white light — cats should catch mice, and mice hiding from cats. And of course, each of the parties, not wanting to be the loser, goes to all sorts of tricks: the cat sits motionless for hours in ambush, or repeatedly bypasses the possession; mouse cleverly disguises its burrow, satisfied with spare moves. But if a careless mouse to get the cat eyes, and… Not in sadness for the tragic for the unfortunate mouse of the outcome, imagine the incident as some kind of game situation. Suppose that at some point, the cat and mouse at the same time fall into a deep labyrinth (Fig. 1). The cat enters in the upper left corner of the maze, the mouse in the lower right. The maze is divided into a number of separate parcels located between adjacent crossing passages. For convenience, each plot is assigned a number: 1, 2, 3… 12. The cat and mouse move at the same speed. They can go around the corner, but to go back to just the distance traveled they can not. If, after three sections, the mouse does not “met” cat, we can assume that she is “saved” (won). Otherwise, it “died” (lost). And the cat and the mouse knows about the presence of the enemy in the maze, but during the movement had no information about each other. Let’s say that they are acting according to a preconceived plan (strategy) the movement in the way their policies do not change. 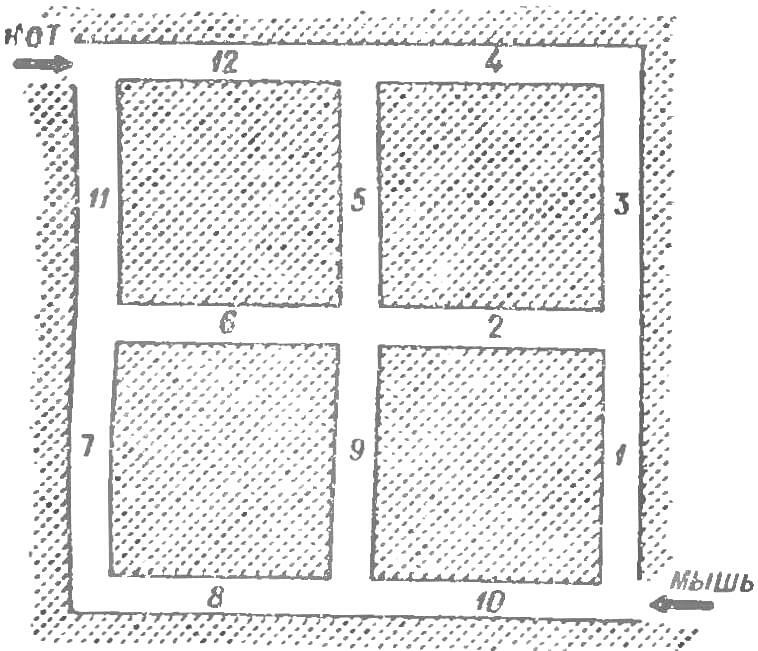 The cat and mouse has 8 different strategies of movement in the maze (Fig. 2). 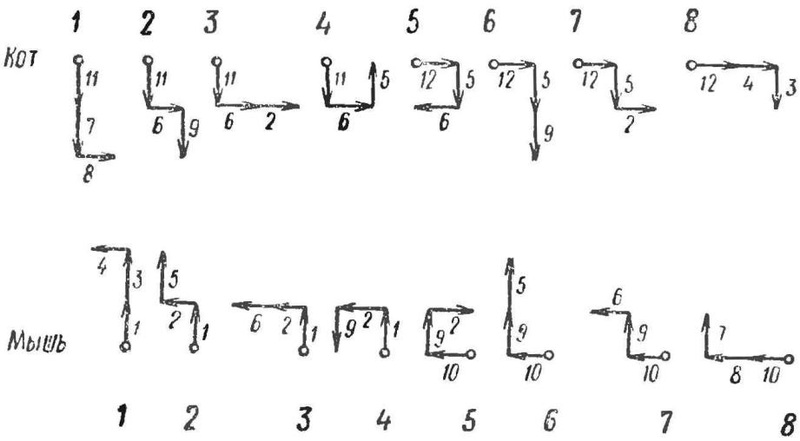 Each strategy of the movement is formed of three conditional sections of the maze (see numbering in Fig. 1). Fig. 2. The strategy of cat and mouse. Fig. 3. Matrix game situations. Fig. 4. It looks like the matrix after conversion. Try to figure out how to behave like a cat and mouse to win the case, we have defined the optimal strategy of their movement. 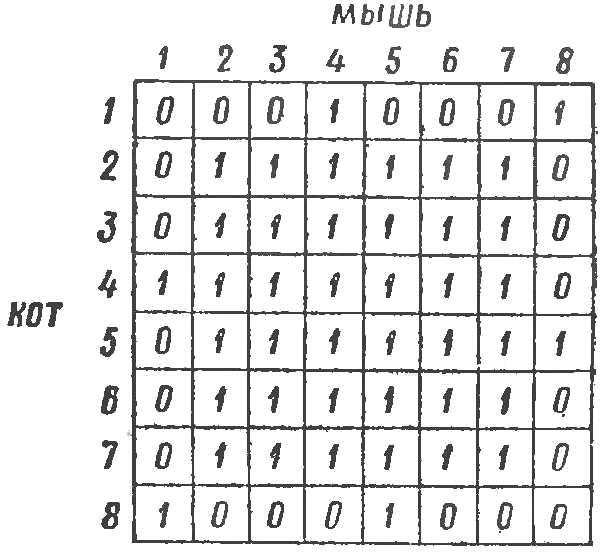 To do this draw a table (matrix) with 8 horizontal and 8 vertical columns (Fig. 3). The figures denoting the vertical columns indicate the number of strategy mouse; horizontal bars — room strategy of the cat (in accordance with Fig. 2). In the cells of the matrix, where it is crossed by the strategy of cat and mouse, put down the numbers 0 and 1. 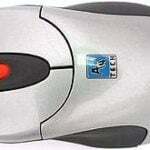 The outcome of the game “the cat caught the mouse” is evaluated as 1, the outcome of the game “the cat missed the mouse” as 0. Considering the filled matrix, you will notice that the mouse is the most profitable to use their first and eighth strategy, since, whatever strategy was employed, the cat, the mouse loses only two cases out of eight. The cat is the most profitable to use their fourth and fifth strategies, because here he wins 7 times out of 8. Thus, our matrix is reduced considerably as we picked out all of the strategies, as the most winning, two strategies of cat and mouse (Fig. 4). figure 3. significantly greater than zero). Now, having mastered the theory of this game, knowing the optimal strategy, you can offer someone to fight with you. 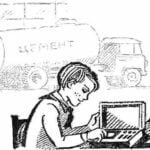 However, your role — the role of the player who knows how to play with the same success can accomplish the electronic gaming machine whose appearance is depicted in the figure 5. The front panel of the machine simulates a maze. Next to each conditional plot of the maze, with the exception of the 11th and 12th sections, is a switch type “toggle”, the inclusion of which partner machine records the selected path. In this highlight the relevant parts of the corridors of the maze. The front panel button, the “Move the cat” (our machine is playing for the cat), the “calculation” button, the light display “You win” and “You lose”, Electromechanical meters, registered the outcome of games played, the switch. 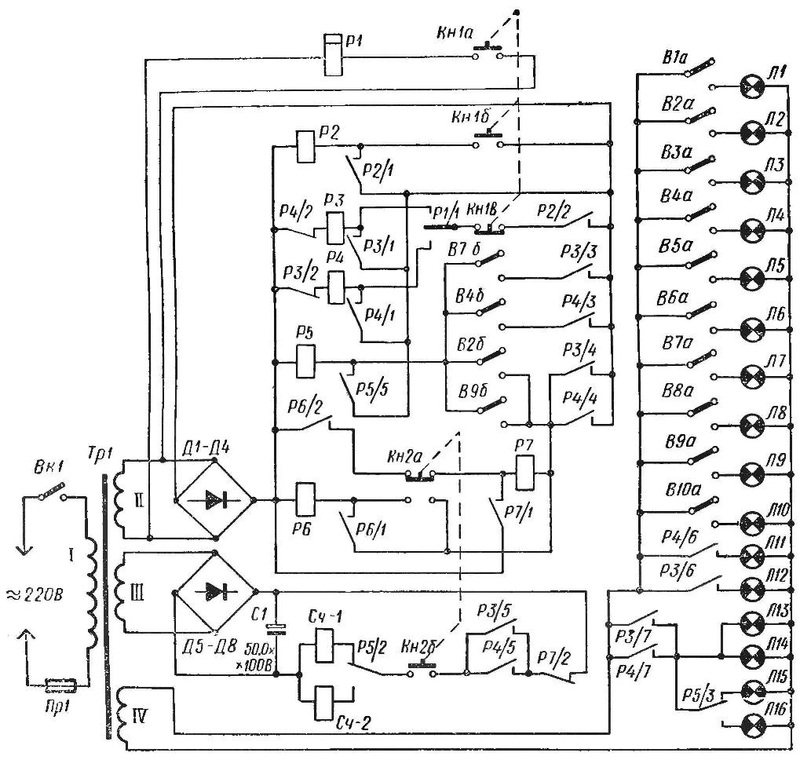 Schematic diagram of the gaming machine shown in figure 6. In the diagram, the switches and turn on their light bulbs marked with the same serial numbers as their corresponding parts of the maze. For example, the switch B1 is located next to phase I of the maze and turns on the lamp L1, illuminating the area. In our design each area is illuminated by three parallel-connected lamp, turn on one switch. In the diagram for convenience, three lamps labeled as one. Starts the game man — he plays For the mouse. He chose the path 1, 2, 5 — include toggle switches B1, B2, B5. Thus, the LEDs L1, L2, L5 and highlight the selected path. By pressing the button KN1 “Stroke the cat” the polarized relay R1 is connected to a source of alternating current, and the contact vibrates with a frequency of 50 Hz, exercising a random choice of one of the two optimal strategies of the machine. Adjustment of the contact of polarized relay two-position, neutral. At the same time closes the supply circuit of the relay R2. It resolves, and prevents its contacts R2/1. After releasing the button KN1 supply circuit of the relay R1 opens and depending on the position of the contact R1/1 of relay P3 or P4. And in the moment when one of the relay pairs РЗР4 at the same time disabling the other. For example, if relay R4, its contacts R4/2 break the chain of relay R3. This is done to ensure that pressing the button KN1 did not change the initial choice of machine. You need to adjust the button contacts KN1 so that when you click on it the contacts Кн1в open before closed contacts Кн1б. Otherwise, if before work, relay P2, contacts Кн1в will not have time to break the supply circuit of the relay Р3Р4, maybe a false positive of one of them. Fig. 5. Appearance cybernetic game. R1 – RP-4; P2, P6, P7 — RES-9 (passport RS4.524.201); P3, P4 — parallel connected relay RS-13 (passport RS4.523.018) and relay RSM-2 (passport Yu 171.81.21). If relay R3, the LEDs L12, Л13, Л14. When relay R4, the LEDs 11, Л14, Л13. Thus, the relay R3 means the application of machine fifth strategy, the relay R4, the fourth strategy of the cat. Structurally, the lamp and Л13 L5, L6 and Л14 located respectively in the 5th and 6th sections of the maze in two parallel rows. 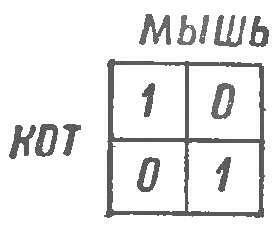 If the paths selected by the machine and its partner, intersect, logical chain of relay contacts P3 and P4, switches V2b, В4б, В7б, В9б, closes the supply circuit of relay R5. Actuating, it cambiocorsa and its contacts R5/3 includes a lamp 16, illuminating display “You lose”. If their paths do not match, the relay R5 will not work, and then the lamp 15, the illuminating display “You won”. The scoreboard can be arranged in such a way as to light up the bulb illuminates the smug face of a cat or cunning spicy the muzzle of the mouse. The machine is also provided a device for scoring games played: counter wins partner of the MF-1 and the winnings counter machine MF-2. For each winning party the winner receives one point, losing zero. To fix the outcome of the game, after clicking the button KN1, click Ки2 “Account”. 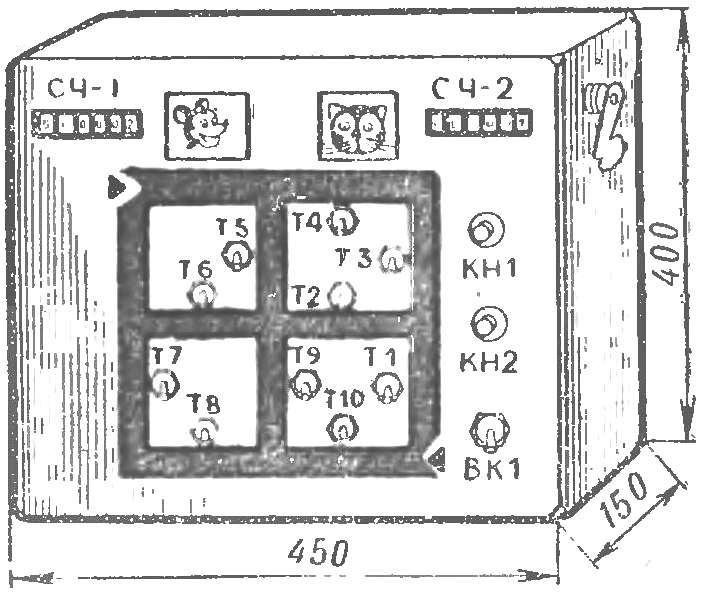 Thus the contacts associated with Кн2б short circuit power meter CQ-1 or CQ-2, the choice of which is determined depending on the position of switching contacts R5/2. To exclude the possibility of multiple points for each winning automatic party in the scheme entered the lock. Its principle of operation is as follows. First, the power supply circuit counters open contacts RZ/5 and P4/5, that is, until the relay is activated P3 or P4, press Кн2 will not lead to a count result. Second, when you press the button Кн2 relay R6, and prevents its contacts R6/1. At the same time its contacts R6/2, the hinging prepare the supply circuit of the relay R7, the actuation of which occurs at the moment of releasing the button Кн2. It cambiocorsa and contacts P7/2 breaks the circuit power meters, which prevents them from triggering when the button is pressed again Кн2. Finally, the relays R6 and R7 will work only if closed contacts P3/4 or P4/4, NLI after the button is pressed KN1 and the machine will make their choice. In order to start a new round of the game, you must disconnect the machine from the power switch Q1, to put all the knobs to the original position, and then the machine switched on again. Reset the results of games played by turning levers, located on the side wall of counters. The machine is applied to incandescent lamp 3,5ВХ0,28A. 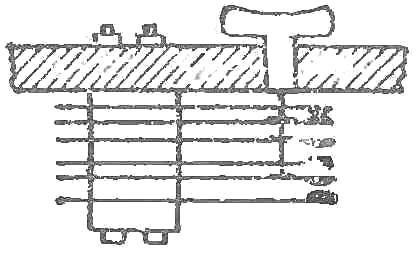 Switch B1 — SPST toggle switch. As buttons KN1 and Кн2 use of relay contacts or the phone key (Fig. 7). In the schema of this slot machine is possible to use electromagnetic relays of any type, with a sufficient number of contact groups (e.g., RES-9, RS-13, RES-22). The polarized relay RP-4, RP-5. Pulse counters — the type of SEI-1. The power transformer is wound on the core Ш32Х35 mm. the Winding of I contains 2750 turns of wire of PEL 0,15; winding II — 300 turns of wire of PEL 0,35; winding III — 600 turns of wire of PEL 0,15; IV winding is 40 turns of wire PEL of 0.5. The rectifiers are assembled in the bridge circuit diode Д226Б. Relay and power supply located on the metal chassis. The size of his 430X130X30 mm. lights and meters are mounted on the vertical Board mounted directly behind the front panel of the machine. The bulb, moreover, placed in a special reflector yaz sheet, repeating the configuration of the corridors of the maze. Thus, an effect of flashing the sharp lines that mimic the way cat and mouse. Scheme the device requires no adjustment. If the installation completed without errors, the machine begins to work immediately after inclusion in the network. NOT THROWN AWAY BUT USED!